Sorry to be bearer of bad news, but at the moment it isn't and I don't think it will be. This is because ghostliness isn't part of the actual model, but an aura that has been attached to normal white wolf, and auras are lost upon taming. For that they would need to make new model with ghostliness build in, which I don't think will happen this far into beta. That's a shame! Thank you for the response. 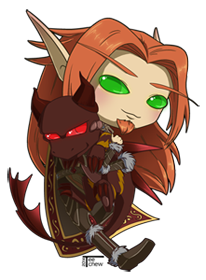 As much as I'd love to tame a cinder or fel wolf, I don't think Gara should be involved at all. Gara's entire story has to do with the void. She was corrupted by it. I think the only thing that could be added at this point is a way to cleanse her. That way Gara would finally be at peace, just like Om'ra had hoped. But due to all we've done for her, Gara could choose to stay & accompany us despite finally being free. It'd make sense and would be a cool way to give us a choice between the void wolf Gara and the ghost wolf. 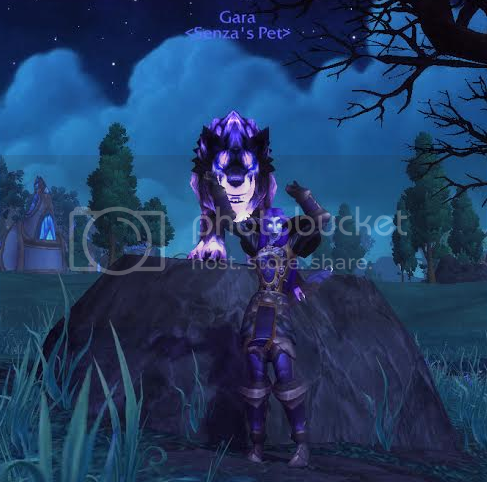 With the cinder & fel wolves, they don't need to be as unique as Gara. They could just add a rare spawn somewhere on Draenor. It could be a track tame, or "normal" rare like Loque, Karoma, etc. that has to be camped. Or it could be like the porcupines that have some weird tactic to them. hrm got into beta, went to the stone, *bm spec* and gara isnt even at the stone? odd? Just visited the stone on my lvl 100 BM Hunter and Gara was there. 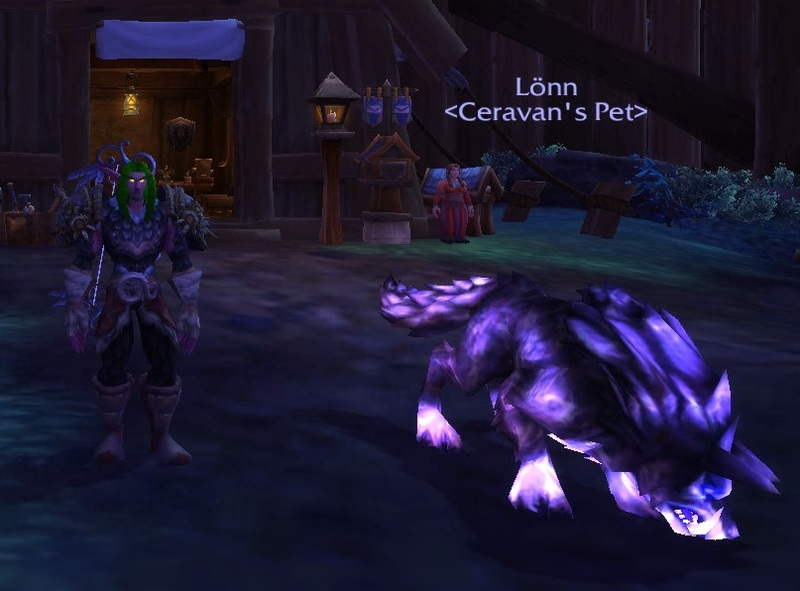 Visited with my lvl 91 BM Hunter and Gara was there for her too - scratched her ears and showed her the snowberries. oh wait nvm, i obviously was looking at the wrong dam spot, i was sitting at the giant rock with that 1 orc with the bones n that lootable relic thing *facepalms* Herpa Derp! Haven't fully scanned this thread yet, however for those that haven't tried yet, other than one part in the whole series of gathering items and such, the "quest" to tame Gara can currently on beta be soloable at 91. The only part not soloable at that level is the level 100 Shadowmoon Voidtwister that drops the Void Lantern, EVERYTHING else is soloable at 91. Just spend a few hours gathering everything I needed, got a hand with the voidtwister and now, at least on beta, I have Gara. Even though I don't play any longer, it is certainly nice to see an opaque spirit beast again, rather than another translucent one. I would just like to say... wow! everyone did a amazing job on this! Thank you all sooo much! I I read through all 46 pages and grateful you guys all figured this out! i cant wait till tomorrow! I just created this username to say thank you! and i like this community! i plan on sticking around and getting to know everyone! Again THANK YOU!! CANT WAIT FOR MY OWN GARA!!! Probably could. But considering I have to collect things from the various zones all the way to 100, I'm just going to wait and get things as I level. I'm in no rush myself. Got my Gara a few minutes ago Soloed it all, level 93, orange cloak and mostly in heroic raid gear. If I can do it, anyone can! [quote="Snypyr"]Got my Gara a few minutes ago Soloed it all, level 93, orange cloak and mostly in heroic raid gear. If I can do it, anyone can! I'm up to the killing Voidcallers part if any other hunters are doing so as well, I'd love to team up. I very well might have bit off more than I could chew trying this at 90. My real id is Faileas#1676 and I'll be on my Alliance side hunter. After a few tweaks... Grabbed a turtle pet and got the garrison ability, I was able to solo it! Gara is now mine! Last edited by Ashaine on Thu Nov 13, 2014 6:34 pm, edited 4 times in total. I tried at 90 and got 4 of the items for the effigy but not without a lot of deaths. I still need the ones from Spires and Nagrand. I don't think I'd be able to kill the 100 void guys though. I'll probably get a few levels and try again. I'm still at 90. My gear is all LFR with 2 flex pieces thrown in. I managed to get up to the point where I need to kill the lvl 100s for the Void Lantern, but after too many deaths I gave up for now. I'm just lvl 91 though and the others weren't that hard to kill. But as a consolation prize I did manage to tame Amaukwa during the first few rush hours of people flocking into Shadowmoon Valley. I managed to get the lantern, but latency killed me while I was on the final part (killing the voidies). As of yet, a second lantern hasn't dropped for me. Can anyone confirm it's *possible* to get another lantern if your first gets wasted?